ENGINEERING. PRACTICE. POLICY. 15 October/November 2018 unmanned systems inside T oday 's consumers t y pi- cally don't want to spend their free time wandering through grocery store aisles or visiting numerous other retailers for the everyday items they need. They want more convenient, stress-free op- tions that make their shopping tasks easier, and many grocery stores are providing that through online order- ing, curbside pickup and home deliv- ery services. Soon, store leaders hope to have an even more advanced option to offer in the form of autonomous de- livery vehicles. Driverless delivery not only adds con- venience for customers, it helps reduce costs for retailers and gives them more f lexibility. This technology also can serve as an affordable way to deliver healthier food to those who don't have easy access to a grocery store, or who have difficulties leaving their home. The benefits are many, and are why compa- nies like Udelv, AutoX, Ford and Nuro are partnering with grocery stores and other retailers to start researching how customers interact with the technology and testing their systems. "Autonomous delivery vehicles are safer, cheaper, and more convenient than current delivery methods," Udelv Director of Business Development Adriel Lubarsky said. "Delivery is one of the largest costs for merchants, and for consumers, has generally been a frustrating experience. By introduc- ing autonomous technology, we're able to reduce overhead for merchants, meaning savings can be passed on to the consumer. It also means merchants can provide better service to customers with deliveries that fit into their daily lives, rather than disrupt them." Testing is in its early phases and is happening all over the countr y in places like California, Texas and Arizona. Oklahoma City's largest gro- cery chain the Buy For Less (BLF) Grocery Company, recently announced an agreement with Udelv that will bring 10 autonomous delivery vehicles (ADVs) to the city next year, marking the biggest deployment of such sys- tems to date. Yes, there are still plenty of challenges to overcome, but it's likely only a matter of time before driverless delivery services become routine. 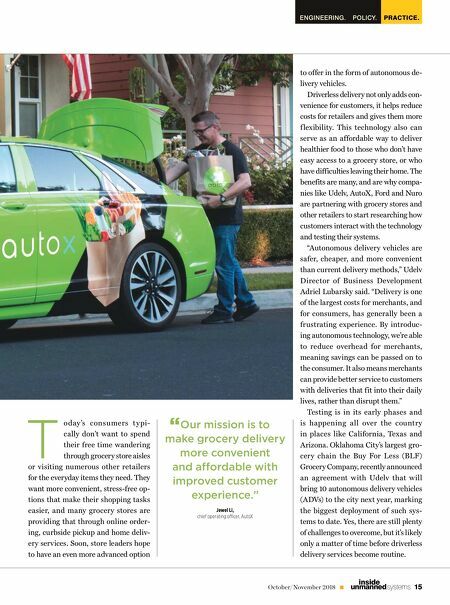 Our mission is to make grocery delivery more convenient and aordable with improved customer experience." Jewel Li, chief operating ocer, AutoX "